WAM is noted first and foremost for its collection of American modernism – works produced during the first half of the 20th century. This is certainly due to the presence of the world’s largest collection of the works of Marsden Hartley and Alfred Maurer, as well as a large collection of pieces created by Works Progress Administration (WPA) artists. Yet many events significant in the history of the University of Minnesota, of which the museum is a part, also relate to the museum’s permanent collection. 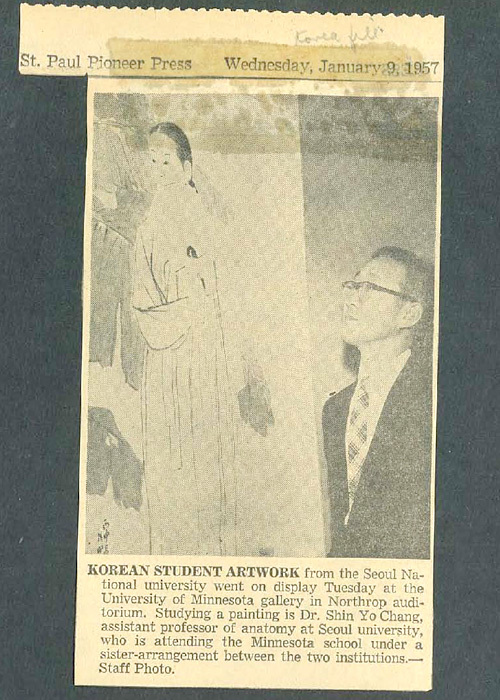 One such event occurred in 1957, when the University participated in an art exchange with Seoul National University in Korea. Work completed by University of Minnesota students and faculty were sent to Seoul National University and vice versa, in an exchange that contributed an artistic component to the on-going partnership that the two universities established in 1954. 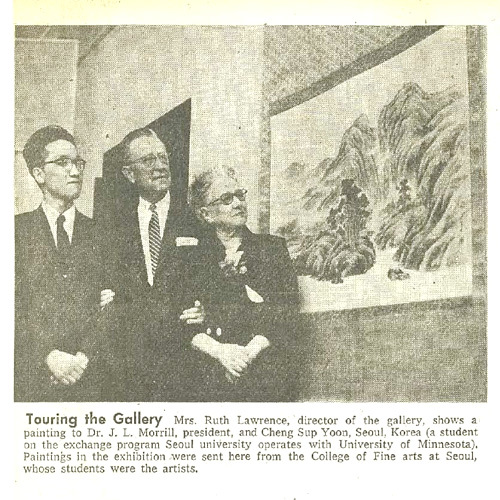 Prior to the art exchange, a partnership with Seoul National University began with a request from the Foreign Operations Administration to the University of Minnesota to aid Seoul National in recovery and reconstruction following the aftermath of the Korean War. An advisory committee was named by University President J.L. Morrill to implement a program of improvement at Seoul National. Architects, doctors, agricultural researchers, engineers, and higher education administrators spent time in residence at Seoul National to advise and assist with the development of coursework and training. Young faculty from Korea traveled to Minnesota to train at the university. The desired result was to rebuild the infrastructure at Seoul National – upgrade heating and plumbing systems, train faculty in emerging technologies, and build supplies of textbooks and equipment. Read a full description of the collaboration in the December 1956 edition of The Minnesotan on the Digital Conservancy (PDF page 35). *Click on the image for a pop-up of a larger version.